When a simple love spell takes a turn for the worse, Sophie Mercer is exiled to Hex Hall, a reform school for the least desirable members of Prodigium society. Having lived in the human world with her non-gifted mother all her life, Sophie is not prepared for all the different students at Hex Hall, and she is definitely not prepared for her first day there. As if getting attacked by a werewolf, sniffed by a shapeshifter, and made fun of by an incredibly handsome and arrogant warlock isn't enough, Sophie also has to deal with her new roomie, who just happens to be a vampire, and a clique of beautiful dark witches who insist that Sophie join their coven. To top it off, there's been a mysterious string of murders, and the prime suspect is the only vampire student on campus. But Sophie can handle it; she is a witch, after all. Hex Hall was a surprisingly good book. 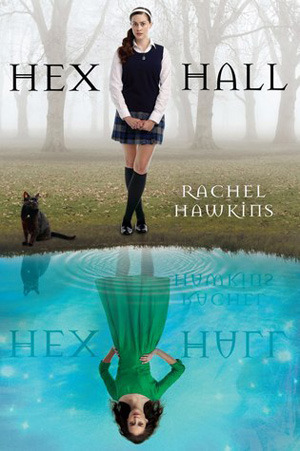 Although I know you're not supposed to judge a book by its cover, I do it all the time, most recently with Hex Hall. I can't tell you how many times I walked past this book and scowled at the cover. To me, it just wasn't appealing. It didn't look like the kind of book that was supposed to be about witches. Eventually I caved, curiosity getting the better of me, and I picked up the book. And, it is safe to say, I was wrong. Hex Hall was an enjoyable book. It was one of those easy reads that gets you back into the groove of a certain genre, in this case, witches. Sophie was a funny, easy-going character, and I liked watching her grow as a witch. Though at some times she was stupid and vain in a way that only spoiled teenage girls can be, Sophie was all right. The other characters in this book were very intriguing. I liked how Hawkins didn't limit herself to one supernatural character. She let her creative mind take charge and included characters ranging from fairies to shapeshifters to supernatural hunters. The whole concept of a reform school for these creatures was beyond interesting; it was hilarious. The teenage angst mixed in was great, too! The main guy, Archer Cross, gave me a good laugh. First, his name was funny (come on, Archer?!) and secondly, he was a very sarcastic wizard. I looked forward to all the parts of the book where he played a big role, and I don't think I spent as much time as I should have trying to figure this guy out. Though in my defense, I was trying to piece together other parts of the puzzle. Surprisingly, nothing really bugged me about this book. I thought the writing was fast-paced, and the characters weren't unbearable. The story itself had a good hook and was deeper than a one plot kind of book. Then why, Allison, isn't this book marked five stars? Well, the book was good—it was all right. And that right there is your problem. The book didn't stick out for me. In a few months I'll forget the names of the main characters and eventually parts of the plot. I think the Harry Potter references in this book made me like it more than I would have originally. But that's me, and in the end, I'm glad I caved and read it. Hex Hall was a good book. I think anyone who enjoys reading about the supernatural or even good old high school drama will like reading this book. I borrowed Hex Hall from the library and will kindly return it. I feel no urge to go run out and purchase a copy. For that, Hex Hall, I thank you. Demonglass, the sequel to Hex Hall, is happily sitting on my dresser at home. Glad to see this one turned out better than expected! Sounds great, and yeah, totally agree about the cover thing. Great review and I'm a new follower! Thanks, I'm getting ready to read the sequel.